With the cost of gas constantly on the rise and obesity becoming a major concern with children today, try a different form of transportation: biking! Biking is a great way to exercise, and it’s fun for the kids, too. While older children can enjoy the independence of riding their own bikes, younger children don’t need to be left out. A child who is old enough to sit on his own bike, but not quite ready to travel independently, might enjoy riding on a trailer bike. A trailer bike is a one-wheeled “half” bike that attaches to the back of a full-sized bicycle. 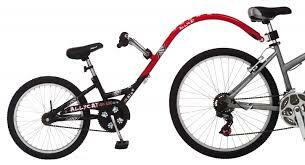 This allows the youngster to get exercise pedaling on his own, but with greater safety being attached to a more experienced biker. Even the youngest children can enjoy the fresh air and scenery of a bike ride. Bike trailers can fit up to two children and are pulled behind a bike. A few bike trailers can even accommodate special fittings for transporting a newborn. (Check with your pediatrician for information on biking with a baby. Many recommend that your child be old enough to support his own head before being ready for a bike ride.) Bike seats, which mount onto a bike, are another option for young riders. Tandem bikes can also be used for family biking. A tandem is a bike with two wheels that can accommodate more than one rider. One type of tandem, called a “quint” can carry five riders. Observe weather conditions and make sure to have the appropriate clothing and accessories for the riders. Avoid riding in hazardous weather.